Dario sta dando ai consumatori il potere di distruggere l'influenza culturale ed economica della mafia. E’ tra i fondatori di Addiopizzo, una realtà che sta creando, per gli imprenditori, opportunità economiche libere dal controllo della mafia e dando ai consumatori nuovi ventagli di opzioni. Il Comitato Addiopizzo è un movimento antimafia nato da un gruppo di giovani intorno a uno slogan: un intero popolo che paga il pizzo è un popolo senza dignità. E’ un movimento aperto, fluido, dinamico, che agisce dal basso e si fa portavoce di una “rivoluzione culturale” contro la mafia, con una strategia inedita: il consumo critico contro il pizzo. I cittadini sostengono con i propri acquisti i commercianti che non cedono alle richieste estorsive e che si sono apertamente schierati contro la prepotenza mafiosa. Come ulteriore declinazione della strategia del consumo critico contro il pizzo, dal Comitato nasce anche Addiopizzo Travel, una società cooperativa che opera nel settore del turismo etico. Oltre che contribuire allo sviluppo di un circuito di economia pulita, Addiopizzo Travel promuove la sensibilizzazione delle nuove generazioni sul reale impatto della mafia ed educa alle azioni che possono essere portate avanti da tutti per contrastarla. Dal 2009, le sue attività hanno coinvolto oltre 11.000 turisti, e hanno prodotto un fatturato di € 615.671 verso imprese pizzo-free, contribuendo allo sviluppo di un circuito di economia pulita. Questa descrizione di Dario Riccobono e del suo lavoro è stata preparata quando Dario Riccobono è stato eletto Ashoka Fellow nel 2016. While the movie The God Father has become a cult in many countries, it has done Italy and Sicily much damage by glamorizing one of their worst social plagues. The mafia is often perceived to be mostly about gangster’s lifestyle. Instead, it is essentially about economic, political and cultural control of a territory through an intensely localized grasp from which all other pathways of power flow. Given its long history with mafia culture , Italy is at the forefront of the anti-mafia movement. It has long been understood that fighting the mafia is not only the responsibility of public prosecutors and the police but of every citizen. The antimafia movement in Italy is large and well-organized. Libera, the main anti-mafia organization is the only Italian NPO to feature in the top-100 list compiled by the Global Journal of Philanthropy. The last few years have seen the emergence of several social entrepreneurs working towards a similar objective but adopting different methods. Dario Riccobono is one of the social entrepreneurs who grew up in a mafia-affected area. He was touched by the anti-mafia movement and later decided to create a new approach to solve the problem from a different angle. Dario was born in Capaci, a small town, sadly known by everyone in Italy as it is the place where Judge Falcone was killed in his car in 1992 (the mafia blew off the highway when he was travelling with his wife). A large social movement was shaped as a result of this tragedy and the anti-mafia movement became a strong player in Italy’s civic society. Important victories were obtained, such as a confiscation law, passed by a popular referendum, to make all goods confiscated from the mafia available to non-profit organisations for free to be used for social good. However, mafia infiltration in all aspects of the social and economic life remains a problem. To be able to assert its rule on Sicily and control the territory, the mafia has collected a local “protection” tax (called Pizzo in Sicilian dialect) for decades. This is still largely collected across the whole of Sicily, even in large cities such as Palermo. Those opposing such a levy, or those calling the police on them, would have their premises burnt and their families threatened. Police would often turn a blind eye to this phenomenon, focusing instead on more violent crime. Darios’s new idea began by leveraging the power of consumers in fighting against the Pizzo. AddioPizzo (goodbye Pizzo) began working in Sicily in 2004 under the slogan “a society paying the pizzo is a society without dignity.” By leveraging the strong sense of “honor” and “dignity” shared by many Sicilians, AddioPizzo began to reframe the concept: not only the pizzo-paying business, but anyone who purchases goods from them, is a tacit accomplice of the mafia. Addio Pizzo began by rallying over 1000 signatures of people who pledged only to buy products or services by businesses who would not pay the pizzo. As the percentage of those paying was over 80%, he created a demand for pizzo-free products. 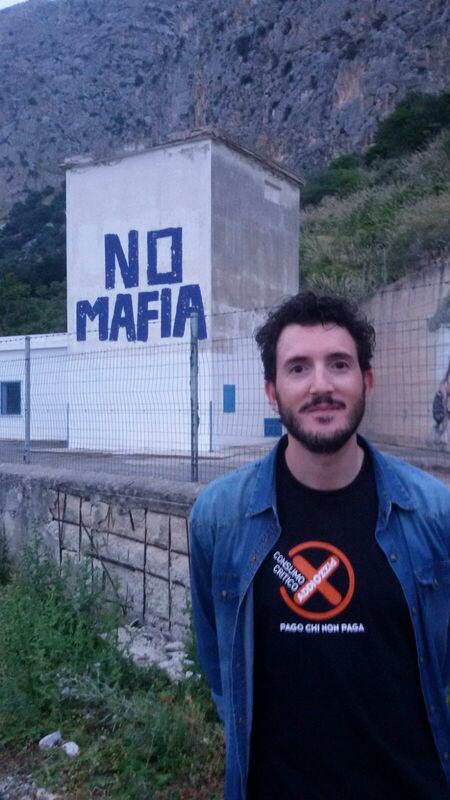 As too many people have lost their lives fighting individually against mafia , Dario understood that the only way out of this eradicated cultural and economic model is to involve every person in understanding that even buying a product sold in a shop that contributes towards the mafia’s racket means to be involved with mafia. Consumers’ behavior has an influence on society and it was time for this behavior to shift. Dario was among the first members of AddioPizzo, brining together individuals who refused to pay the pizzo into a movement working towards change in Sicily. Dario’s role as a leader and social entrepreneur became overt as in 2009 he created a spin-off of Addio Pizzo called AddioPizzo Travel. Dario understood that the mafia was becoming a global economic giant, and it could be fought only if the same mindset shift among citizens and consumers happened outside of Sicily, in the rest of Italy and beyond. As Sicily is part of a common European market, in which goods and people are free to circulate, Dario understood the power of including non-Sicilians in the fight against mafia. This struggle needed to spread to as many regions and countries as possible and at the same time focused on the younger generation, which has the highest potential to win this fight against the mafia in their lifetime. He began therefore to focus on tourists and schools. Tourists visiting the island can use Addio Pizzo Travel as a tour operator as well as a cultural mediator. They will organize a holiday in which every hotel, car rental, restaurant, etc is part of the network and is certified mafia-free. They will also offer the opportunity to join one or more specific tours which present Sicily through the lenses of the antimafia: they will show you how the movement began, take you through the first businesses to rebel, to the houses of the first young people who said no to the mafia and lost their lives because of it. You can explore the economic power of the mafia, or the political one. The same offer, albeit age-specific and more in depth, is offered as an option for schools. Rather than visiting only the historical or artistic heritage of Sicily, Addio Pizzo Travel makes sure that young people and their teachers are made aware of the power of the mafia and that they become actors of change in their own communities. Addio Pizzo is powerful movement which in anchored in Palermo and focused on local change. Addio Pizzo Travel, on the other hand, has the power and ambition to become a global player by creating awareness of the mafia infiltration in the economy to more and more people and to empower them to begin by leveraging on their power as consumers through an anti-mafia brand. This could be extended to other areas of Italy in which a similar illegal levy is raised by organized crime (Calabria, Campania) but also to other countries with similar problems but lack of civil society involvement in fighting it. Italy is by many means made up of two economies. One in the North, highly competitive and innovative, and a stagnant one in the South . While the divide has often been attributed to “historical” or “cultural” issues a major factor for the South to lag behind is that the economy is largely in the hands of organized crime. “I believe this is the most complete and essential definition of mafia that can be provided: mafia is a criminal association with the purpose of illicit enrichment for its members, that stands out as a parasitic and violent intermediary entity between property and work, between production and consumption, between the citizen and the State”. Still relevant after forty years, Sciascia’s definition of Italian organized crime introduces a crucial point: mafia-type criminal groups affect and modify the entire social structure of a community. Approaching the mafia analysis in such terms is crucial to comprehend criminal phenomena in Italy as well as to recognize similar kinds of behaviour worldwide. In this way, a global method to undermine the spread of organized crime can be produced. The first and most important characteristic of the mafia is widespread territorial control. These organizations operate as an alternative state, thus the total control of a region and its inhabitants is fundamental. Even when spreading in big cities or other countries, their main source of power remains the small town of origin, where they keep family ties and connections. The main decision-making bodies are still rooted in the original area. Organized criminal groups gain citizens’ trust by offering services that the State is failing to provide and that are seen as basic rights: job positions, infrastructures, health assistance, and all sorts of opportunities, creating a powerful network of dependency based on the fulfilment of people’s personal interests. Violence is only the ultimate solution to conflicts. Whatever goes wrong in this system can be solved with violent acts: political conflicts (e.g. a major or council member undermining the interests of the criminals), social conflicts (e.g. trade unionists asking for more rights), conflicts with other criminals (e.g. debts not paid or feuds inside the organization). There are three powerful organized crime groups in Italy: Cosa Nostra, the Sicilian mob; Camorra, the Naples’ mob, and ‘Ndrangheta, Calabria’s mob. These groups have spread their destructive tentacles also deep into northern Italy and internationally. The reason that they are killing or kidnapping less than in the past is because business is going well. It is well known in Italy that the mafia resorts to violence only when they are in perceived danger. The basic traditional tool to control a territory politically and economically is through racketeering. Entrepreneurs and shop owners are coerced into racketeering, i.e. paying regular money for protection. In the legal market, the racket and, more generally, the presence of mafia alters the structure of economic incentives and hence the efficient allocation of resources, reduces the overall wellbeing of a population, present and future, with a direct impact on the prospects for economic development. It is difficult to quantify the damage that organised crime has had on Sicily, Italy and the rest of the world-. According to the UN Office on Drugs and Crime (UNODC), transnational organised crime generated a US$870 billion profit in 2009, corresponding to 1.5% of global GDP. The IMF estimates the amounts of money laundered globally each year at 2%–5% of GDP. There is ample research linking money laundering with reductions in overall annual economic growth rates: each US$1 billion laundered is estimated to reduce overall economic growth by 0.04-0.06% in the OECD countries concerned. Through sophisticated money laundering schemes and through careful investments in particular sectors, these groups not only attempt to justify their immense wealth, but present themselves on the market as strong competitors who can afford to operate “at a loss,” creating a situation of quasi-monopoly that undermines the basic principles of free market in the long run. Businesses that are most vulnerable to infiltration are: restaurants, bars and hotels, real estates, the energy and waste sector, the healthcare system, the internet sector. Another activity is that of asking a pizzo to retailers (a “tax” to the criminal Boss). In Italy more than 200’000 businesses are believed to pay the pizzo, for a total amount of about 10billions euros. In Sicily 70% of enterprises give part of their earnings to mafia bosses, in Calabria about 50%, 40% in Campania and between 5-10% in the northern regions. Having control over a territory means having control over the citizens’ votes, leading to a strong power relation with politics. Democracy is paradoxically strengthening the mafia behaviour, since a larger number of voters leads to more vote control in the hand of criminals. The more resources (power, connections, money) the State has in a territory, the more it can be corrupted and used for criminal purposes. Criminal groups belong to no specific party or political side: they corrupt and take advantage of any politician depending on the situation. Organised crime is invisible, it is hard to recognize. Moreover, it is often protected and legitimized by civil society because it grants jobs and opportunities where the State is failing. These elements often lead to a denial of the issue, which is its main strength. Organized crime alters the competitive impersonal rule of the market and it imposes its own rules and its own personal relational systems to maintain control of the territory. Most people in Sicily have never known a valid alternative to paying money for protection. They just passively accept it as a cultural norm. After a decade of recession, Italy is slowly emerging from the economic crisis. It is now the time to rebuild Sicily through a positive economy. At the same time, elsewhere in the world, large economies such as Mexico’s, have surrendered large parts of the country to the de facto control by narco-mafia. It is time for a model which puts citizens at the center. Dario’s strategy is composed of three elements. His first objective is to connect AddioPizzo to the rest of Italy and the rest of the world, by making sure more and more businesses choose to free themselves from pizzo to join this network. For this to work those who want to report extortion to the police needs to see their condition improved, both in terms of personal safety than economic wellbeing. In the past, the state and the police were seen by most as antagonists and “snitching” would be seen as a betrayal of the community. It did not help that the police could do little about extortion unless there was “proof”. With a limited budget it was virtually impossible to install camera or bugs in all businesses across Sicily, so the results of reporting the crime to the police were null. Conversely, as the extorters would be called in for a trial, the mafia would take revenge for “snitching,” either by violently damaging the business, hurting the owner or their families, or by ordering anyone else to stop purchasing in that shop, thus condemning the person to bankruptcy. Dario and Addio Pizzo began working closely with the police to making sure reports would be followed closely and often helping with the legal work necessary to properly sue the perpetrators. By creating a network of proud businesspeople who said no to the mafia, they also created a psychological and cultural incentive: people would feel less lonely in their battle and encouraged in their struggle. Critically, by engaging a mass of critical consumers, they would ensure that those joining AddioPizzo would have a new clientele, as a payoff for part of the clientele they would inevitably lose. It is difficult to gather data on the rate of payment of the pizzo, as statistics are not collected on a supposedly illicit activity. A study by SOS Impresa puts the number of businesses paying the pizzo in Palermo at around 80% in 2005 and around 70% today. This roughly equates to the around 1000 businesses who have joined Addio Pizzo in the last ten years. IlSole24 ore, a financial paper, puts Palermo among the top three cities in Italy for the number of police reports on racketeering and extortions. While this may sound as a defeat, reporting crime is a positive indicator of the climate of fear and control of the territory by the mafia changing. Since 2009, Addio Pizzo Travel added to these incentives by massively increasing the number of consumers who would commit to buy products and services by members of AddioPizzo. This is the second element of his strategy. As Sicily is a popular national and international tourist destination, he saw the purchasing power of tourists as a new drive for change. Addio Pizzo Travel organizes tours of Sicily by making sure all the services purchased, from hotels to restaurants, from car rental to bars, are pizzo-free. In doing this he reaches another key objective: that to make more and more people aware of the danger that the mafia represents in Italy and abroad. Tourists are taught to understand that they can make a difference by choosing to spend their money in mafia-free products and services. During their stay, Dario offers a tour of anti-mafia to understand the issue beyond the clichés of the Sopranos. The tour guides are called “cultural mediators” as they indeed make an effort to explain the Sicilian culture through the eyes of the mafia and anti-mafia history. This objective is further pursued with the third element of the strategy: market Addio Pizzo Travel among schools to get the next generation to know the mafia better and therefore being able to fight it more successfully. In many ways, this has become the central mission of Addio Pizzo Travel. In 2014, 262 tourists travelled through the agency, compared to a total of 1800 students, of which 1150 Italian and 650 foreign. Dario works directly with high schools to pick Sicily as a destination for the annual educational trip, typical within the last three years of school in Italy. Young people get to know Sicily and learn about civic engagement, entrepreneurship and history at the same time. Compared to the tourists, the school trips are more closely followed by Addio Pizzo Travel and the “cultural mediation” much more in depth: it becomes the main part of the trip, rather than an add-on, as it is for tourists. To date, over 12.000 people have travelled through Addio Pizzo Travel. As the average cost of one’s stay can be estimated to be around 1000€, we can calculate that around €12m have already been kept away from the mafia and directed towards those who say no to it, while at the same time involving thousands of people, in different countries, in the struggle against organized crime. Any profit that Addio Pizzo Travel may make at the end of the year is reinvested in Addio Pizzo or other local anti-mafia organisations. Addio Pizzo Travel can scale in many ways. As more consumers and tourists join the Addio Pizzo network and travel through it, more businesses are likely join the pizzo-free community in Palermo until the tipping point, so that Addio Pizzo can then move to other parts of Southern Italy and the rest of the world. It can also grow by focusing on its branding, by perhaps creating a pizzo-free label for products, in the same way as fair trade products receive a certification. His role with schools can also profoundly change the education system, by working with students after they visit Sicily and engage them in anti-mafia activities in their cities or countries. This model can also expand beyond Italy to other countries affected by criminal control of a territory. Dario belongs to the generation that came of age in the 1990s, when waves of bloody public assassinations of prosecutors, police and anti-mafia priests paralyzed Sicily. Dario was just 13 years old when a team of anti-mafia prosecutors, including Giovanni Falcone, and Paolo Borsellino labored to orchestrate a concerted effort to combat the Mafia and the rising tide of violence. They were both killed in car-bombing plots. Giovanni Falcone was killed in Capaci, Dario’s birth town. He remembers the big explosion noise and running with his father to see what happened. A month later, Paolo Borsellino was assassinated too. Dario heard the news on TV and he remembers his father’s desperation. That was the moment when he understood something really terrible had happened. He knew that from that moment onwards he would have worked to transform his region and country. In 2004 he joined Addio Pizzo, a network that was beginning to gather and strengthen the small group of entreprenurs who said no to the pizzo. He profoundly changed the organization and created his own spin-off, Addio Pizzo Travel, to make this have an impact outside Sicily.